An indoor venue may be decorated to recreate the luxurious interior of a Moroccan tent. Ideally, an outdoor location would set the perfect stage for such a celebration. Look for a venue would offer ample space to set up that single, major decor element that would immediately say, “Welcome to Morocco”—a pavilion-style tent or a grouping of smaller tents. If an outdoor venue is not available, or if the weather is unpredictable, a large indoor terrace or veranda with a view of a garden would work just as well. Whether outdoor or indoor, the key is to transform the venue into the luxurious, sensual interior of a Moroccan tent with the right decorating touches—from rich colors to luxurious decorations and dramatic lighting to theme-inspired place settings. Bold and vivid hues such as purple, fuchsia, and orange may serve as base colors, appearing in fabrics draped around the interiors and over the tables, in pillows and ottomans, in throws and carpets. Gold and jeweled tones of blue may serve as accent colors, appearing in various table details such as luminaries, charger plates, and other elements. Sparkly and illuminating features with candlelight that is varied and multi-layered. Fabrics that are a visual as well as a tactile delight—such as lamé, organza, satin, chiffon, even embroidered fabrics—are perfect for such a display. Each table, set low in the Moroccan tradition, can be swathed in a tablecloth and runner of these fabrics, and flanked by over-sized pillows wrapped in jewel-toned satin. For a more authentic feel, a number of poufs or ottomans made of tooled leather may be added among the pillows. Have Persian or Oriental area rugs and throws cover the floor. Their intricate patterns and rich colors typify Middle Eastern decor, while their overlapping and angled placement lends a relaxed, inviting atmosphere to the entire occasion. Shapely and decorative pieces make wonderful table accents for that authentic look. Filling the party with the heady fragrance of dried rosebuds, broken cinnamon sticks, ginger slices, cumin seeds, and citrus peels presented in small glass bowls; and diffusing the scents of rose, cinnamon, and sandalwood essential oils in burners around the venue. Offering guests refreshing mint iced tea or warm, spicy coffee in vari-colored Moroccan tea glasses with ornate gold trimmings; and setting out condiment dishes filled with dried dates, figs, and nuts as appetizers. Play with multiple colors and textures to achieve a Moroccan tablescape. 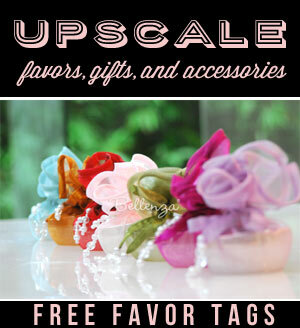 Worried about finding decor items? Alternatives can actually be sourced from the crafts of other cultures. Think Indian brass work, English or Spanish wrought ironwork, and South American pottery have qualities akin to Moroccan decor that make them acceptable options. For the truly resourceful, Middle Eastern-inspired sconces, braziers, and lanterns might be discovered at a lighting or landscaping supplies center. Vessels for romantic tea lights may be as simple as paper luminaria or terracotta wine pots from a home decor store, or even mosaic or enameled plates, or coasters from a discount tourist shop. Brass or gold-finished pitchers or teapots reminiscent of Aladdin’s lamp, or colored glass decanters shaped like a genie’s bottle may be unearthed at a flea market or thrift shop. Amidst all these rich colors, fabrics, and textures, carefully-designed lighting casts both a subdued glow and an inviting air of mystery on the entire scene. Bright gold accents with jeweled highlights make for a truly magical look. The general illumination in the venue is best kept dim, or concentrated in key areas for the guests’ convenience, such as the entrance and exit—and if outdoors, along the pathways leading to the tents. Arriving guests should almost feel like they are being led into a private sanctuary where delightful table-top treasures glistening in the light of lanterns and candles are a welcoming sight. In place of traditional floral centerpieces, for instance, artfully arrange groupings of glass cylinder luminaries at the center of each table. The luminaries may be simple glass cylinders wrapped half in gold leaf and half in translucent parchment paper, silhouetting Arabic-inspired cutouts when the tea lights inside are lit. Alongside this centerpiece composed of luminaries, tiny tea lights in bejeweled candle holders (see above photo) bring a gem-like glitter to the table setting, with the glow of each reflected by a bed of colored glass beads. The varying heights of the luminaries and votives also add dynamism to the display. Moroccan tea glasses in red, purple, yellow, and green can serve as tea light holders as well, further enhancing the colors of the table scene. 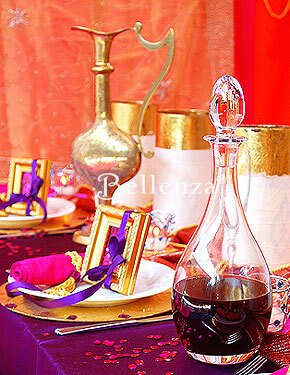 The place settings are another focal point for highlighting the richness and opulence of Morocco. The creative twist lies in incorporating the party favors as appealing place setting elements that guests will be thrilled to take home afterwards. 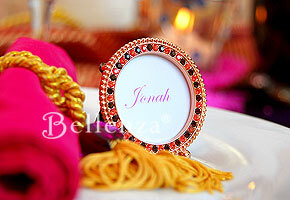 A gold frame (left) and an orange and ruby petite crystal frame (right) double as eye-catching place setting elements. Start with place settings that aptly reflect the event’s color palette of jewel tones accented with gold. For each guest, assemble a gold charger plate set with purple rhinestones, and a fuchsia napkin rolled “Persian carpet style” and tied with a tasseled gold cord. Set out a gold picture frame with Arabesque engravings and filled with glittering magenta sequins as a striking decorative piece and, as hinted by its satin ribbon, a gift for each guest as well. 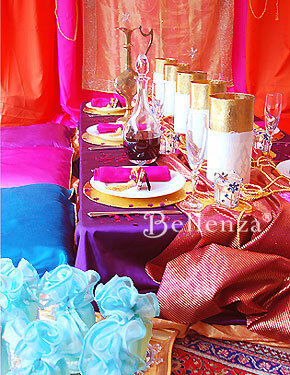 Or give colorful candles wrapped in sparkling fabric materials with crystal place card holders. For entertainment and fun, why not consider these ideas? Have a belly dancing performance starring the bride and her bridesmaids. 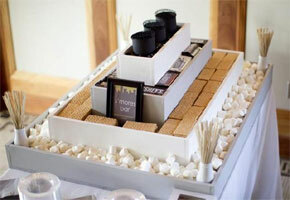 It would definitely make a big surprise for the reception guests. Play exotic sounds of Morocco featuring instrumental music inspired by African and Middle Eastern influences. Include modern Moroccan dance music, too. You can also hire a live band to play for guests as you dance the night away. For desserts, try meskouta (orange cake), Moroccan cookies, sfenj (Moroccan doughnuts), and Moroccan ice cream in flavors like dry fruit, coffee, pistachio, orange blossom, and burnt honey. To allow you to DIY most of the elements for this themed occasion, here is our post update as of November 2018! Great ideas! In addition to flea markets and thrift shops, you can also find some great decorating pieces from antique shops and even at garage sales. The candle rings with pearls are really pretty! Are they attached to a base (looks like a mirrored coaster) or are they loose to slip around the candle itself? 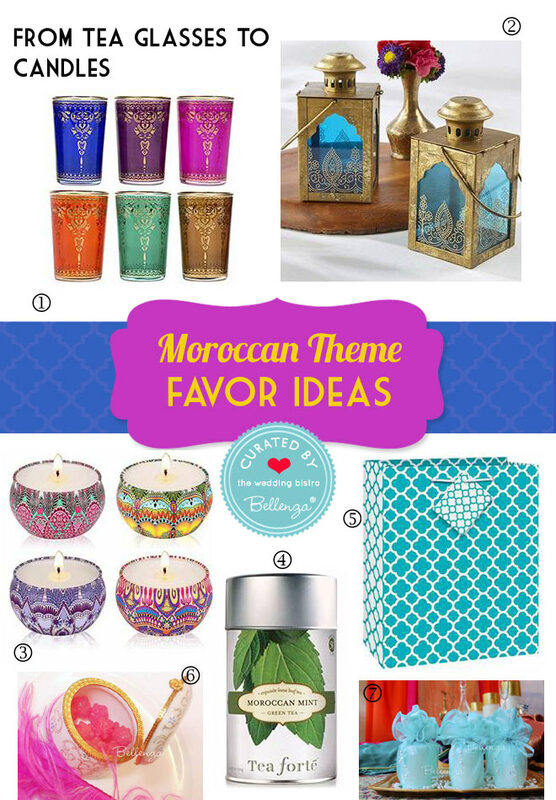 Does anyone know where is the best place to find those colorful Moroccan tea glasses? I thought a place like Ikea would have them, but I can’t seem to find them anywhere. Any ideas? I’m also in love with this concept. For my engagement party, my fiance and I decided to have an Arabian Night’s theme that is very similar in decor to a Moroccan theme. We’re actually having belly dancers, too! It should be a hit! I’m so excited. I love this theme! We’re actually planning a very similar idea for our engagement party and we will be giving out boxes of Turkish delights as favors. They will be wrapped up in those pretty organza wraps! Have fun with the planning! I really enjoy looking for pretty and unique ideas.Thanks, for all your creativity! I thought this was gorgeous!!! I am in love w/ the rich deep colors of the Moroccan decor. It just screams passion and you have included the vibrant purples ( my fave color) and blues colors off wedding/ reception that I was looking for. This is one of the most informative pieces i’ve read! I love your photos! 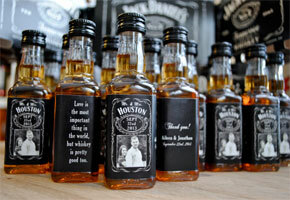 For my upcoming party at New Year’s, we are having this theme! As favors for guests, my sister and I will be filling some tea light glasses from Ikea with gold-foil Hershey’s Kisses. The shape of the chocolates matches my color scheme of fuchsia and gold! Gorgeous! This is perfect for a summer party that I am planning for my daughter’s Sweet 16 birthday. We’re having it in a big garden patio with a pool, so creating an oasis will be lots of fun. The pool will have floating tealights! OMG!! 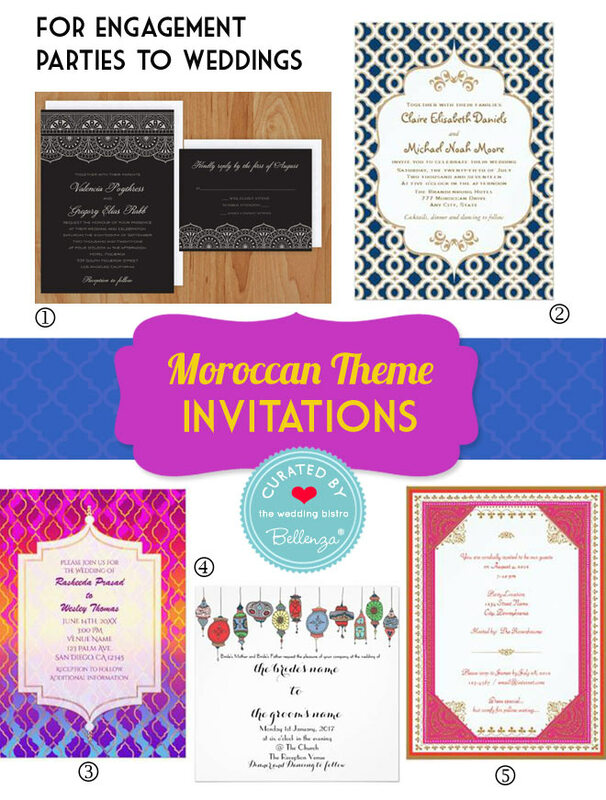 I have been planning on having a Moroccan themed wedding. So glad I found this!! Keep the ideas coming!! i’m so excited i found your website what a treasure trove of great ideas. I would really appreciate some help, my boyfriend and I got engaged 3 days ago, we planning on getting married in january in natal, either down the coast umhalnga side or in the midlands meander. Does any one have any suggestions of venues? 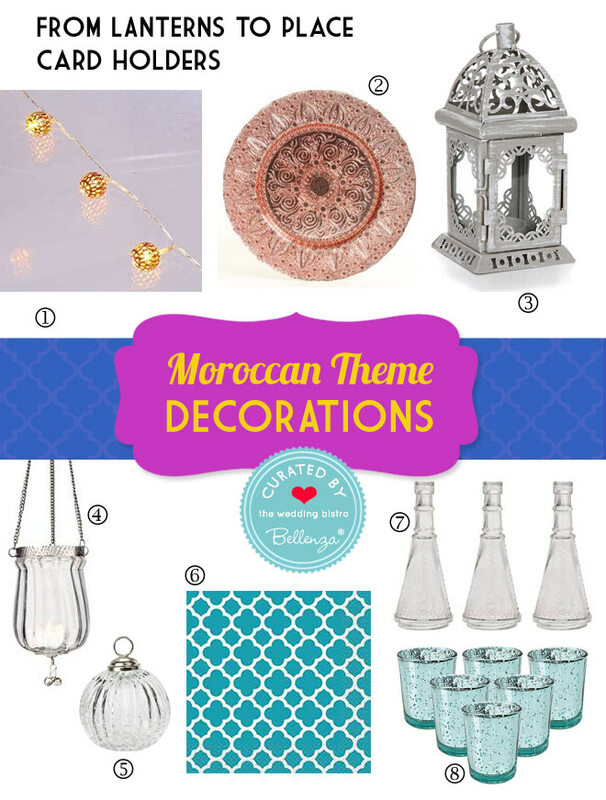 We are looking at a morrocan theme because we love arabic, and the colours and fabrics. Also , does any one know where we can get lanterns, and tea lights? Are there any shops in Natal that sell, Ive been living in Cape Town and I’m a bit out of touch with whats available. thanks, any help will be great. Oh I am really loving these ideas!! I’m hoping to do a Moroccan themed party for my nieces Golden 15th birthday this year! That’s really great! We’d love to see how it went! I’m loving all these jewel tones. xo, chrissy.